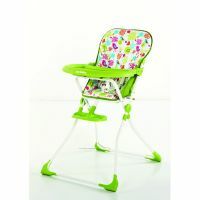 This high chair from Sunbaby features a large tray that provides a lot of space and can be used well to place your baby's essentials like bottle, napkins, water and much more. Thanks to the lightweight and portable design of this baby high chair, you can carry it even when you are going on long trips without any difficulty. To Recieve updates and possible rewards for Sunbaby Delite Delux SB 4216 DLX Pink please sign in. To Recieve updates and possible rewards for High Chairs please sign in.